The Common Fund’s Regulatory Science program was a collaborative effort to accelerate the development and use of new tools, standards and approaches to efficiently develop medical products and to more effectively evaluate medical product safety, efficacy and quality. A major focus of the program was the development of cutting edge microphysiological systems (MPS), or “tissue chips”, to more accurately predict drug safety and efficacy in humans. The Common Fund’s Regulatory Science program, initiated in fiscal year 2010 as a partnership between NIH and the U.S. Food and Drug Administration (FDA), aims to foster regulatory science, a specialized and inter-disciplinary area of biomedical research that serves to generate new knowledge and tools for assessing experimental therapies, preventives and diagnostics. In 2012, the NIH Common Fund and the National Institute of Neurological Disorders and Stroke led the trans-NIH effort to establish the NIH Microphysiological Systems (MPS) (Tissue Chip for Drug Screening) program, which now is led by the National Center for Advancing Translational Sciences (NCATS). The NIH Common Fund and NCATS Cures Acceleration Network provided most of the funding for the program, with several NIH Institutes and Centers also providing funds. This initiative also participated in collaborations that focused the resources and ingenuity of the NIH, Defense Advanced Research Projects Agency (DARPA), and FDA. An advanced liver-on-a-chip that includes multiple cell types which compared to less complex liver models more accurately reproduces liver function. Models of rare heart diseases such as LQT syndrome and Barth Syndrome in cardiac MPS. A kidney MPS that can model glucose uptake, kidney tissue damage, and blood clotting. Blood vessel systems that can dilate/contract, support immune cell transport, and vascularize other tissues-on-chips. Cancer models such as bone cancer and breast cancer metastases in liver. Functional coupling of the intestine, liver, kidney, blood-brain barrier and skeletal muscle tissue chips. A model of the human female reproductive system that can mimic the complete 28-day menstrual cycle. 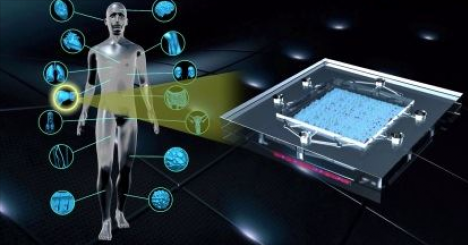 Multiple NIH-supported tissue chips integrated into the DARPA funded ten tissue platforms. Integration of the heart and lung tissue chips to model asthma. Integration of the intestinal and liver chips to study the role of organ interactions on breast cancer metastases. The Regulatory Science program has transitioned from Common Fund support. Common Fund programs are strategic investments that achieve a set of high-impact goals within a 5-10 year timeframe. At the conclusion of each program deliverables will transition to other sources of support or use within the scientific community. The Regulatory Science program was supported by the Common Fund from 2010 to 2017, but the Tissue Chip program led by the National Center for Advancing Translational Sciences (NCATS) will continue to support this important research with the goal of developing tissue chips that can be used to experimentally predict whether newly developed drugs will be safe and effective in humans. Please note that since the Regulatory Science program is no longer supported by the Common Fund, the program website is being maintained as an archive and will not be updated on a regular basis. To learn more about the Tissue Chip program watch this information video from NCATS or meet Chip, an interactive model of the innovative developments from this program.